Took the Insanity Asylum Workout Fit Test yesterday. Its always important to do the fit test before jumping into a new workout program as you will see where your fitness currently is. The Insanity Asylum workout is no different. 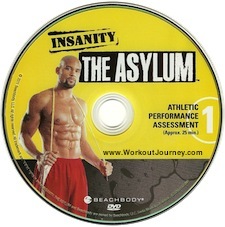 Shaun T calls it the Insanity Asylum Athletic Performance Assessment. Don’t know why Beachbody had to go with such a long name. The Athletic Performance Assessment DVD is about 25 minutes long and has 9 different exercises in which you have to do as many reps as you can with good form in about a minute. Here is how I did. I’m pleased with the strength tests but not so much with the speed ones. I already know that speed is my weakness and is the thing I need to work on the most. The one thing I tried to focus on when doing the Insanity Asylum Workout Fit Test for the first time was form. Too many times in the past I would do a fit test and focus on trying to keep up instead of doing the move the proper way. This is what happened when I did the Insanity Workout Fit Test. I expect these numbers to go up dramatically over the next 30 days. Hopefully the weather will warm up a little bit here in Michigan so I can do the next fit test outside. As you can tell by the video my house is not all that big and it was kind of cramped. Leave me a comment below and let me know how your first Insanity Asylum Workout Fit Test went. He’s set the bar for this household. Me and Jessica do our test tomorrow… Can’t let my son beat me. Looks like your son beat me on a couple. No need to worry. Old man strength will prevail.